Get a $150 cash back bonus after charging $500, within 90 days, to a new American College of Physicians Credit Card. Finance larger purchases for the first 12 billing cycles by making at least the minimum payment due with an introductory APR of 0%. Certain restrictions and limits apply, so make sure to read the fine print in the application. The Visa Signature Card from Bank of America, offers many features such as lost luggage reimbursement, cell phone protection, extended warranties, and more at no cost to the cardholder. 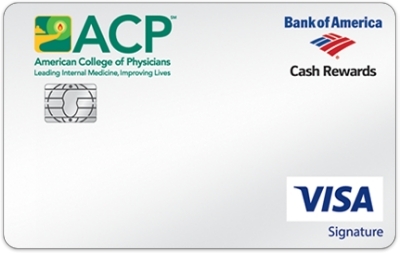 This credit card is open only to members of the American College of Physicians(ACP), which serves doctors on a variety of ways according to its web site. For details about the credit card and an online application visit the membership benefits page. Get a $150 cash back bonus (after spending $500 within 90 days of opening an account) and benefit the American Quarter Horse Association. Plus pay no interest for the first 12 Statement Closing Dates following the opening of your account with the 0% Introductory APR. It’s easy to choose by simply going to the Mobile Banking app or to Online Banking and changing your choice category for future purchases once each calendar month, or make no change and it stays the same. 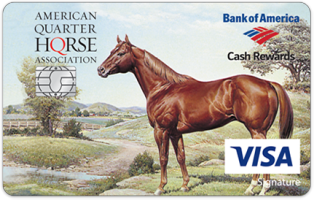 For more details and information visit the American Quarter Horse Association credit card application page. 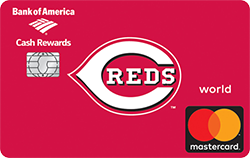 Cincinnati Reds Mastercard new cardholders enjoy 0% financing on purchases or balance transfer(3% fee) for the first 12 billing cycles. As an extra incentive after qualifying purchases of $500 or more within 90 days of account opening, you receive 15,000 bonus points ($150). The rewards continue with the World Mastercard from Bank of America giving shoppers cash back for every dollar spent with the card anywhere Mastercard is accepted. Show your support for the Cincinnati Reds this season and be rewarded in return for your loyalty by applying here. United Community Bank of Georgia (UCBG), with locations throughout Georgia, North Carolina, Tennessee, and South Carolina, offers new customers either $25 or $100 cash back bonuses when opening a credit card account. Ranked “Highest Customer Satisfaction with Retail Banking in the Southeast Region, Five Years in a Row” by J.D. Power, United Community Bank gives local clients several choices of credit cards to suit their individual needs. Visa benefits such as extended warranty coverage, auto rental collision damage waiver coverage and zero fraud liability. To find out how to get the best deal on your credit card balances UCBG has an entire page of financial calculators where you plug in your numbers and get the answers you’re looking for. Visit their home page for a full list of services they provide.